Ultiworld Disc Golf’s 2018 Roller of the Year voting is presented by Friction Gloves; all opinions are those of the author. Check out our review of Friction’s DG Gloves here. With that in mind, we are proud to present the third of four bracket challenges to close out the year. We’ve culled highlights from the sport’s best media providers and broken them down into four categories: Roller of the Year, Air Shot of the Year, Putt of the Year, and Ace of the Year. After each bracket is decided, the winners will battle in a four-way, College Football Playoff-style bracket that will determine the 2018 Shot of the Year. Pick your favorite entry for Roller of the Year from each matchup below, then come back next week for the next round. And if you’re having fun with this, feel free to share the love on social media. A special thanks to Jomez Productions, Central Coast Disc Golf, the Disc Golf Pro Tour, and others for capturing these clips. And we’re off! Hole 17 at W.R. Jackson is already a battle to navigate the elevation and dense trees, so when Ricky Wysocki, with a foot in the extra rough, pulled this roller out to curl next to the basket for an easy birdie, it immediately made this list. We wish we had better video of Will Schusterick’s putter roller from Pro Worlds that hopped a rock wall on the Brewster Ridge course. A more traditional roller line at USDGC, Nate Sexton throws these in his sleep. Catrina Allen’s 450-foot roller is what Follow Flights were made for. Watch the angle it hits the ground, and the way it tracks through the golf fairways to the pin. These type of shots helped Catrina to the win at the Beaver State Fling. Rollers usually find the concrete platform on the left side of the fairway on Ledgestone’s final hole. A.J. Risley was well up the hill from that danger zone and cruised more than 100 feet past the normal landing zone. Nolan Grider has probably through this roller a hundred times, but has he ever thrown it this well? That’s 600 feet. Eagle can do stupid stuff with those D-Line FDs. What even is this forehand, flip-up roller at the Wintertime Open? Speaking of stupid stuff, Eagle made his own fairway at the Disc Golf Pro Tour Championship on this long par 5, and he was rewarded with an eagle for it. Another USDGC showdown, with Josh Anthon using a roller to get that tricky approach, and Zach Melton pulling his out for big D.
Being able to hit a gap in the woods with a roller is already a win, so when Chris Dickerson got all the way to the basket after hitting his line at the DGPT Champ we should have known he’d win the whole thing. Pure distance here from Ricky at the GBO. Right before Eagle did this, Simon Lizotte’s roller went about 500 feet or so. Eagle beat him by at least a buck. Simon still gets on the list though with this PD2 power roller at Beaver State. 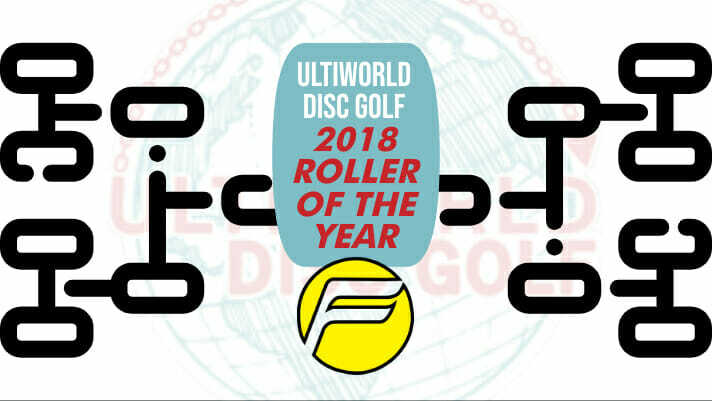 Comments on "2018 Roller Of The Year Bracket"